Last week Betsoft released their most amazing game yet -- another visually stunning video slot game. The new Stampede is tribute to the majestic animals of the African savannah. It's an “all-ways-pay” slot machine so there are 1024 possible winning combinations on every spin. After any winning spin, you'll have the option of gambling all or half of your win in the Double Up game. Three or more Acacia Tree scatters trigger up to 20 free spins where Wilds double or triple winnings. Earn tournament points playing Stampede, 4 Seasons, Who Spun It? and Mama Mia slots by Betsoft, December 1 - 3, 2017. 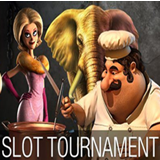 You can also win tournament points by joining a famous chef as he prepares the perfect dish for a critic in the tasty Mama Mia slot. Now that’s a spicy meatball! The Who Spun It? slot immerses us in a classic murder mystery. You'll advance through multiple game levels to discover the location, the weapon and the killer. Cuddly animals depicting the signs of the Chinese zodiac play in a tranquil garden that changes with the seasons in the Asian-themed Four Seasons slot.